The global foot orthotic insoles market is expanding at a rapid pace due rise in percentage of population requiring orthopedic devices to reduce foot pain and increase in geriatric population with orthotic condition across the globe. The market was valued at US$ 3,176.4 Mn in 2017 and is projected to expand at a CAGR of 6.3% from 2018 to 2026 to reach US$ 5,425.8 Mn by 2026. The global foot orthotic insoles market is driven by surge in adoption of technologically advanced products and high prevalence of osteoarthritis, rheumatoid arthritis, juvenile arthritis, and other forms of disorders. Foot orthotic insoles are of two types: prefabricated and customized which are manufactured using different materials, such as, thermoplastics, polyethylene foams, leather, cork, composite carbon fibers, ethyl-vinyl acetates (EVAs), gel, and others (such as nylon). Foot orthotic insoles are being used by both pediatric as well as adult population for medical and other applications. These are employed in various applications, such as, sports & athletics, medical, and personal comfort. The medical application segment of the foot orthotic insoles market includes diabetes, plantar fasciitis, arthritis, back & foot pain, and others. Other medical applications include, but are not limited to, hammertoes, blisters, bunions, metatarsalgia, etc. Foot orthotic insoles are distributed through various channels, including, drug stores, hospitals & specialty clinics, online stores, and others. The others segment includes sport retailers and sport shops. Growth in geriatric and obese population is likely to propel the adoption rate of foot orthotic insoles during the forecast period. According to the U.S. Department of Health & Human Product, the U.S. is expected to have about 72.1 million geriatric population by 2030, which is more than twice the number that was in 2000. A large number of global manufacturers who have technical expertise and core competencies are making constant efforts toward developing and manufacturing novel products to attract more customers. Improved biomaterial-based insoles offering high strength and low wear are witnessing an exponential rise in demand in developed as well as developing countries. Rapid adoption rates are observed for technologies, such as, 3D bioprinting, custom-made foot orthotic insoles, and computer-aided fixation of foot orthotic insoles. Advantages offered by technologically advanced products, such as, reduced complications and improved lifecycle of the product are boosting the demand for these products among end-users. This is likely to drive the market during the forecast period. 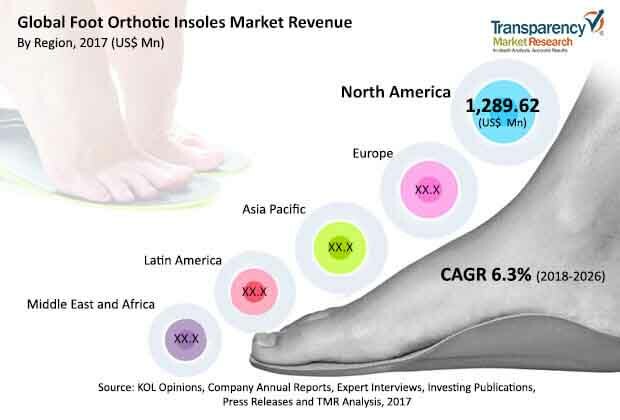 Rise in demand for custom-made foot orthotic insoles is anticipated to offer potential business development opportunities in the global foot orthotic insoles market during the forecast period. Custom-made foot orthotics are specially made shoe inserts designed to fit perfectly to the feet. These products provide support and comfort to users. They are manufactured after complete evaluation of the foot structure of the user. Moreover, clinical studies conducted to compare the effectiveness of custom-made and prefabricated insoles conclude that custom-made foot orthotics are more effective than prefabricated ones as they provide foot comfort while reliving painful foot conditions. Mergers and acquisitions represent strategic move of the market players for strengthening and broadening of their product portfolio. The foot orthotic insoles market is highly fragmented, with a large number of small players operating individually across the world. Merging of two competitors unites the strengths of the two firms involved while reducing competition and pricing pressure. Based on material, the global foot orthotic insoles market has been divided into thermoplastics, polyethylene foams, leather, cork, composite carbon fibers, ethyl-vinyl acetates (EVAs), gel, and others. The ethyl vinyl acetate segment dominated the foot orthotic insoles market in 2017. Use of an EVA footbed in insole manufacturing is becoming increasingly popular nowadays owing to its comfort supporting properties. The thermoplastic segment is projected to expand at a significant CAGR during the forecast period. According to a research published by the ARPN Journal of Engineering and Applied Sciences in May 2016, thermoplastic material showed higher tensile strength, hardness, and flexure during 3D printing by fused deposition modelling. In terms of application, the global foot orthotic insoles market has been classified into sports & athletics, medical, and personal comfort. The medical segment has been further categorized into diabetes, plantar fasciitis, arthritis, back & foot pain, and others. The medical segment accounted for a leading share of the global foot orthotic insoles market and is projected to continue with its dominance during the forecast period. Significant target patient population which is likely to use foot orthotic insoles throughout their lifetime and availability of reimbursement are the major factors expected to drive the segment’s growth. The sports & athletics segment is poised to expand at a significant CAGR during the forecast period. In terms of distribution channel, the global foot orthotic insoles has been categorized into drug stores, hospitals & specialty clinics, online stores, and others. The hospitals & specialty clinics segment held more than 30% of the global market in 2017 and is likely to marginally gain its market share by the end of 2026. Preference among patients for hospitals & specialty clinics due to presence of skilled personnel and proper infrastructure as well as relatively high cost of foot orthotic insoles owing to the availability of prescription foot orthotic insoles at these settings are likely to contribute to the continued dominance of the segment during the forecast period. Based on region, the global foot orthotic insoles market has been segmented into five major regions: North America, Europe, Asia Pacific, Latin America, and Middle East & Africa. North America accounted for a dominant share of the global foot orthotic insoles market, holding more than 30% share in 2017. Europe held a prominent share of the global foot orthotic insoles market in 2017. Well-established health care infrastructure, rapidly increasing geriatric population, and large base of foot insole manufacturing companies have led to the dominant share of North America and Europe in the foot orthotic insoles market. The foot orthotic insoles market in Asia Pacific is projected to expand at a rapid CAGR during the forecast period owing to surge in investment in health care infrastructure, rise in disposable income of people, growing economy, large population base with chronic diseases and other foot pain conditions, and expansion in the distribution network of leading players in the region to establish themselves in the lucrative market. Major manufacturers are collaborating with emerging companies having novel product pipeline. This amalgamation of technical expertise of key players and novel product techniques or materials of new market entrants is expected to introduce new products with improved functionalities during the forecast period. Major players operating in the global foot orthotic insoles market include Bayer Group (Dr. Scholl's), Powerstep (Stable Step, LLC), Superfeet Worldwide, Inc., Ottobock, A. Algeo Ltd., Hanger, Inc., and Bauerfeind AG. Birkenstock digital GmbH, Ottobock SE & Co. KGaA, Foot Science International, Create O & P, Groupe Gorgé, and DOLA – Digital Orthotics Laboratories Australia.